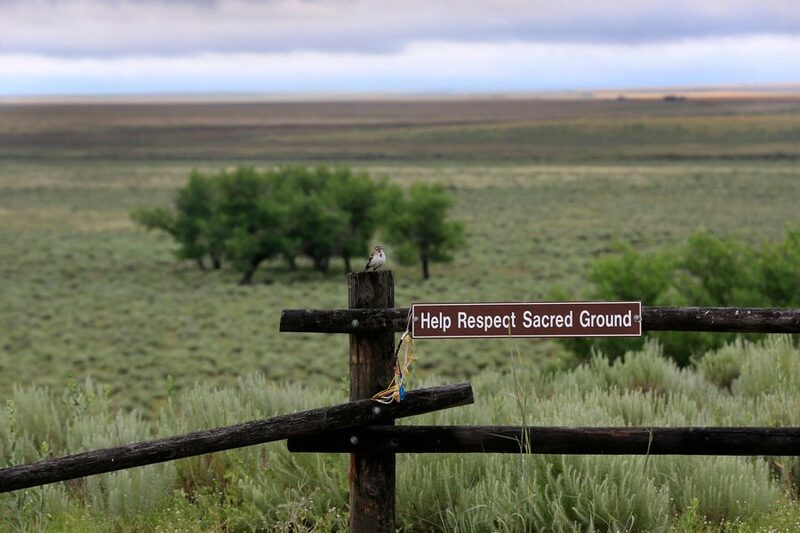 A bird rests on a fence post overlooking the area of where the massacre took place at sunrise at the Sand Creek Massacre National Historic Site on June 29, 2016 near Eads, Colorado. Northwestern commemorated the 154th anniversary of the massacre. Descendants of the Sand Creek Massacre victims — Otto Braided Hair, Karen Little Coyote, Fred Mosqueda and Gail Ridgely — shared their family’s pain at an on-campus commemoration of the massacre’s 154th anniversary. The commemoration attempted to grapple with Northwestern’s ties to the massacre. John Evans, one of the Northwestern’s founders, was the territorial governor of Colorado and the Commissioner of Indian Affairs when the massacre occurred. A report released in 2014 by Northwestern found that Evans did not directly order the attack, but did not serve Native Americans’ best interests as superintendent of Indian Affairs and refused to acknowledge the massacre after it occured. It also said he fostered an environment that allowed the massacre to happen. A separate report from The University of Denver, however, found Evans “deeply culpable” for the massacre. Jabbar Bennett, associate provost and chief diversity officer, acknowledged the work the University has left to do in supporting the Cheyenne and Arapaho people. At the Sand Creek Massacre, Cheyenne and Arapaho people were mutilated, for “no reason,” said Karen Little Coyote. The panelists said remains are still being sent to them, which they take to Sand Creek for a proper burial. The panelists spoke about the history of the event. Prior to the panel, a video ran about John Evans and the pain he caused. Ridgely pled to students to be a part of the movement of getting the stories of Native Americans’ right. “We controlled that area. That was our land, that was our home base…. They started to restrict us,” said Mosqueda. The panel was followed by a bonfire by the lakefill, where the descendants led a memorial song. Weinberg junior Zoe Johnson said she attended the event because she wanted to learn about Native American history. The commemoration was organized by the Office of Institutional Diversity & Inclusion, Multicultural Student Affairs, the Colloquium on Indigeneity and Native American Studies and the InclusionNU Fund. This was the University’s fifth commemoration. “It’s emotional, it’s hard to talk about what happened to our people. Thank you for understanding our history, where we came from and where we’re going. We won’t ever let this happening again,” said Karen Little Coyote.